Can you really wakesurf behind a jetboat? Chaparral Boats says you can on the Chaparral 223 Vortex VRX. The Chaparral 223 Vortex VRX tows wakeboarders behind its 400hp jet engine. Here’s something we didn’t see coming: a jetboat with wakesurfing capability, also know as the Chaparral 223 Vortex VRX. The Chaparral Vortex 223 VRX debuted at the 2015 Sydney boat show and managed to turn the common perception of towboats on its head with a twin 200hp Rotax powerplant. When Trade-a-Boat reviewed the first-generation Chaparral Vortex 203 VRX late last year, we found a scorchingly fast jetboat that was a lot of fun, but with limited wake-riding capabilities, due to the lack of a propeller. Less than 12 months later, Chaparral has the solution in the Vortex 223 VRX – a 400hp screamer with the safety of jet propulsion, but with three ballast tanks and a specially-designed transom that creates a sculpted, surfable wake. The ASP (Aerial Surf Platform) is available on Chaparral’s new 223 and 243 Vortex twin jet bowriders and integrates into the existing swimplatform to provide a bigger staging zone for watersports and relaxation. Scott O’Hare from Chaparral Australia said the major advantage of riding behind a jet is the safety aspect with no propellers – perfect for families. Common to the Vortex range of sports bowriders is modular seating on the passenger side, where a forward facing seat quickly transforms to an aft-facing lounge. 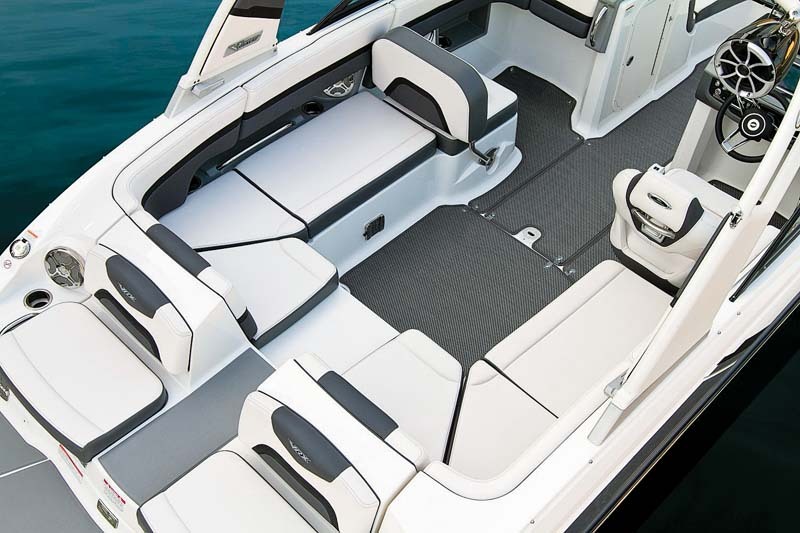 There’s storage for coolers and gear at both ends of the boat, along with multiple stereo remotes and two positions for the removable table that stows under the helm console. Incredibly for a 22-footer, there’s seating for 10 people, although that capacity comes at the cost of overwidth towing requirements for local buyers. And the performance? As you’d expect from a lightweight hull that packs 400hp of rotary jet power, it’s nothing short of eye-watering. Extreme holeshot transports you to a top speed of around 46kts, but there’s plenty of down-low grunt for pulling riders from the water.